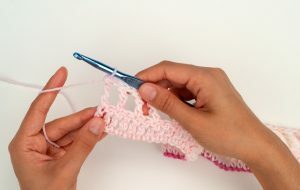 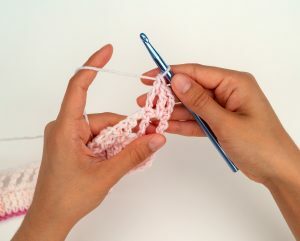 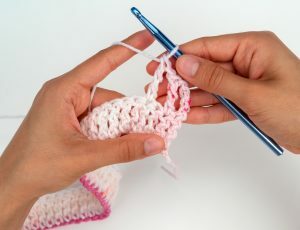 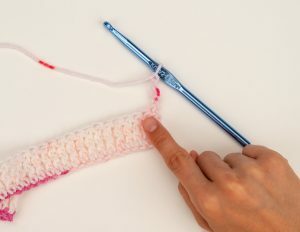 Row 1: Ch 66, and put 1 tr in the 4th ch from hook. 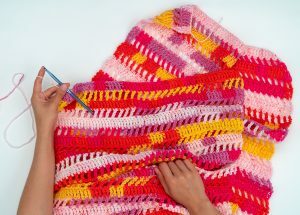 Then place 1 tr in the next ch, and in each ch across the entire row. 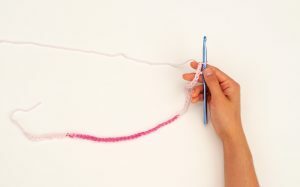 Row 2: Ch 4 and turn. 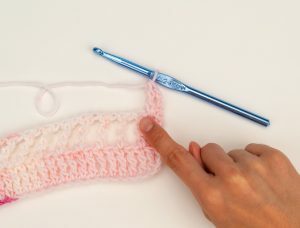 Skip the 1st st of the row, and put 1 tr into the next st. *Ch 1, skip the next st, and put 1 tr in the next st. Repeat from * across the entire row, ending with 1 tr. 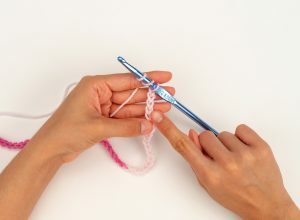 Row 3: Ch 3 and turn. 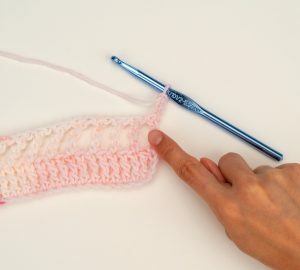 *Place 1 tr in the (ch 1, skip 1, 1 tr) space from the previous row, then put 1 tr on top of the 1st tr from the previous row. 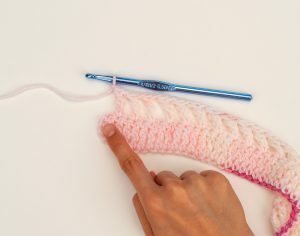 Repeat from * across the entire row, ending with 1 tr. 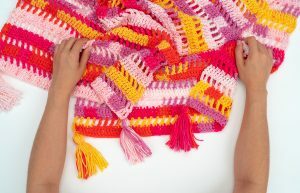 Rows 4-63: Repeat rows 2-3, alternating. 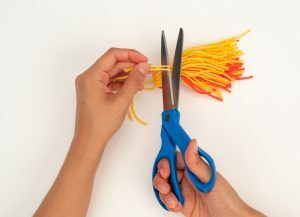 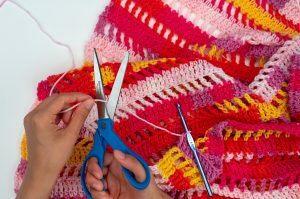 Cut yarn & weave in all ends. 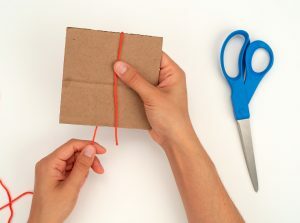 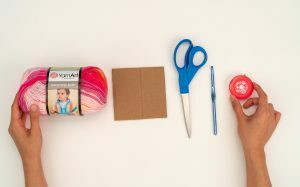 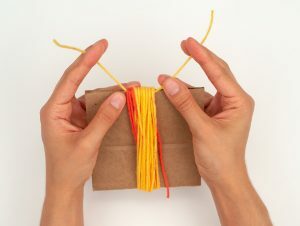 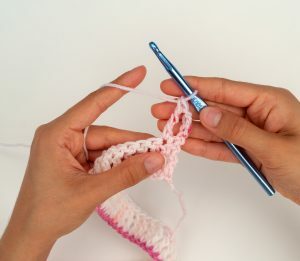 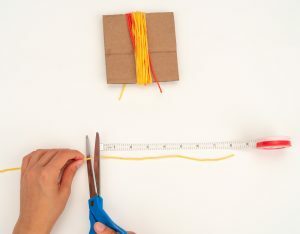 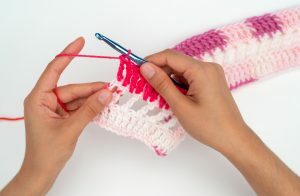 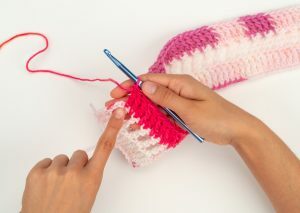 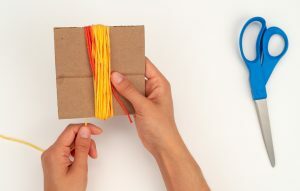 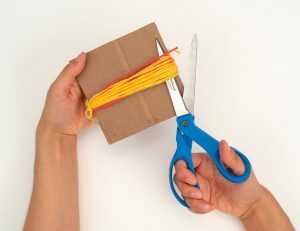 Step 1: Take your 4.5″ x 4.5″ piece of cardboard, and wrap the yarn around it 30 times. 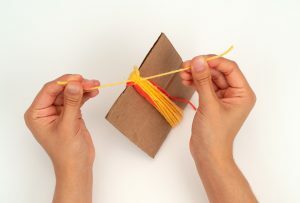 Step 2: Cut the yarn, and tie a second, 8″ piece of yarn to the top of the yarn bundle as pictured. 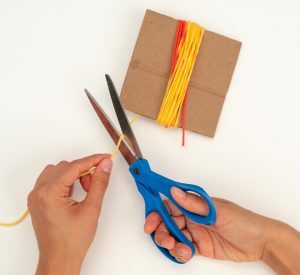 Step 3: Now, cut all of the yarn at the bottom of the yarn bundle as pictured. 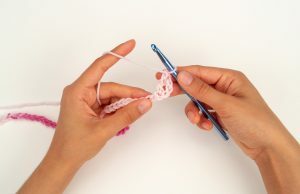 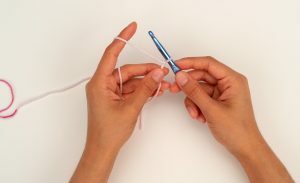 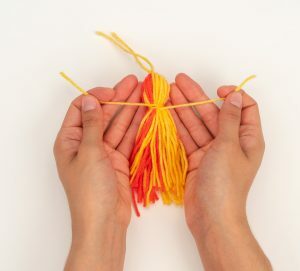 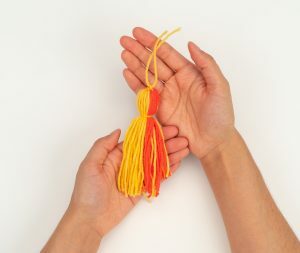 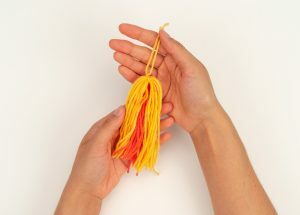 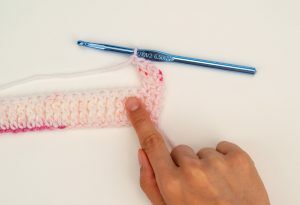 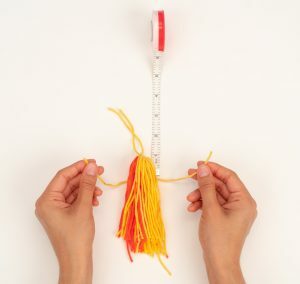 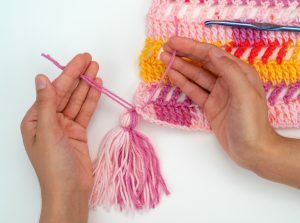 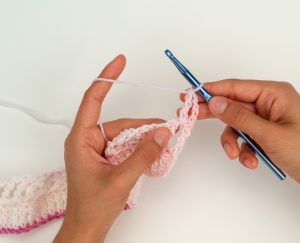 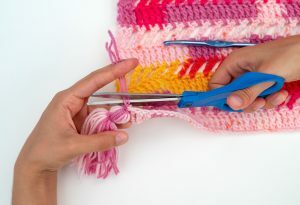 Step 4: Take 1 more piece of yarn, (8″ long) and tie it 1″ down from the top of the tassel. 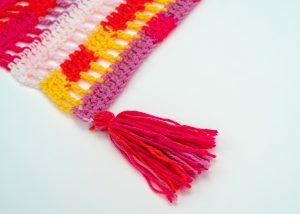 Step 5: Cut all of the yarn at the bottom of the tassel evenly, and attach to 1 corner of the shawl as pictured. 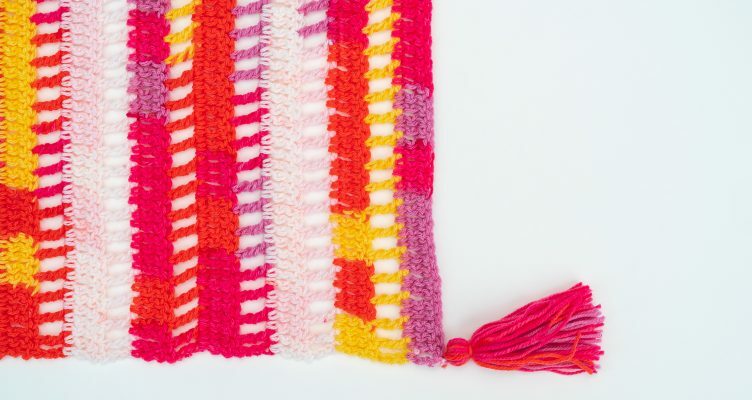 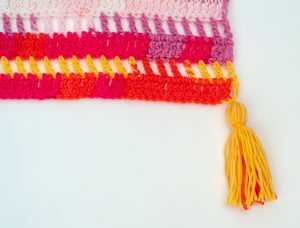 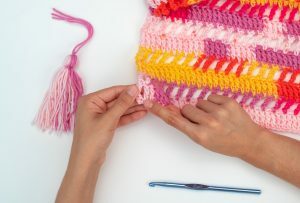 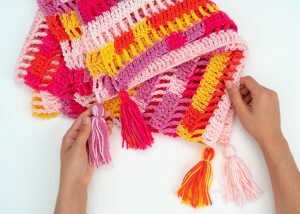 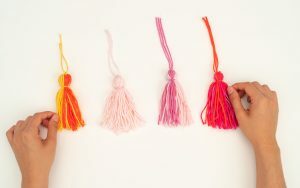 Step 6: Repeat steps 1-5, three more times, by attaching 1 tassel to each of the remaining 3 corners.